Present in the very first year of the initiative, 1996, when the tournament was staged in Brisbane; now over two decades a later, it is a return to the state of Queensland and for the host nation hopes of a repeat. The Seamaster 2017 ITTF World Tour Platinum Australian Open will be staged in Gold Coast, situated some 40 miles south east of Brisbane; play commences with the qualification tournament on Sunday 2nd July, the main event ensues on Tuesday 4th July. In 2017 it is the eighth time that Australia has hosted an ITTF World Tour Tournament; the first bringing a measure of success to the host nation. On that occasion, Mark Smythe, who was to be the Oceania representative at the1998 Men’s World Cup, partnered Canada’s Johnny Huang in the Men’s Doubles event; they were beaten in the final by Austria’s Karl Jindrak and Werner Schlager. It is the only occasion when an Australian male player has reached an ITTF World Tour final. Later Karl Jindrak and Werner Schlager won again in 1999 when they overcame Chinese Taipei’s Chang Yen-Shu and Chiang Peng-Lung in the final; to date they are the only duo to win an ITTF World Tour event in Australia on more than one occasion. No other pairs have won twice and no singles event has ever been won on more than one occasion. Meanwhile, Werner Schlager and China’s Kong Linghui are the only players to have won the both the Men’s Singles and Men’s Doubles titles at the same ITTF World Tour tournament in Australia. Werner Schlager completed the feat in 1996 when overcoming Johnny Huang in the final; Kong Linghui in 1998 when after partnering colleague, Liu Guoliang to doubles success, he beat Korea’s Kim Taeksoo to be crowned Men’s Singles champion. Conversely for the women it is not unusual. Such a feat has been achieved in four of the previous seven ITTF World Tour tournaments in Australia; notably in the first four editions of the tournament. 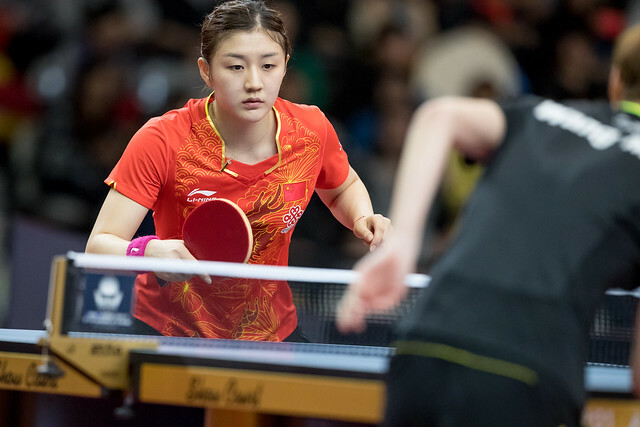 In all instances representing China at the time, in 1996 Wang Chen partnered Zhu Fang to Women’s Doubles success prior to securing the Women’s Singles title at the expense of Japan’s Yuko Michihiro. One year later in 1997 Deng Yaping and Yang Ying won the Women’s Doubles title; later Deng Yaping overcame her doubles partner to secure the Women’s Singles crown. Once again in 1998 Yang Ying was involved, she won the Women’s Singles title beating Wang Chen in the final, having earlier enjoyed Women’s Doubles success when partnering Wu Na. Three success for China, in 1999 it was success for Chinese Taipei; Chen Jing, who in 1988 when representing China, had won Women’s Singles gold at the Seoul Olympic Games, emerged successful in partnership with colleague Xu Jing before beating Sun Jin, at the time on duty for China in the Women’s Singles final. Meanwhile, for Australia, the only female finalists are Jian Fang Lay and Miao Miao; they were the runners up in 2014 in Sydney and last year in Melbourne. On both occasions they suffered at the hands of Japanese opposition; in 2014 the lost to Saki Tashiro and Yuko Fujii; in 2016 to Honoka Hashimoto and Hitomi Sato. Pertinently, in 2017, in the Women’s Doubles event, they are the no.8 seeds. It is only recently, since 2014, that Under 21 events have been staged at an ITTF World Tour tournament in Australia. Japan has always provided the finalists in the Under 21 Women’s Singles event; in the Under 21 Men’s Singles, it is the same with one interloper. Korea’s Jang Woojin won in 2015, beating Yuya Oshima in the final.